A longer walk through hills and valleys around Lee, returning via the Coast Path. The village of Lee, situated on the rugged north Devon coast -and surrounded by beautiful unspoiled hills and valleys, is an ideal starting point for some longer circular walks. Once known as Lower Warcombe, Lee was connected to the inland hamlet of Higher Warcombe by footpaths and by a narrow, steep and twisting lane. This walk combines stretches of both these old routes, and so gives access to some of the loveliest and most peaceful combes, nestling in the lee of the massive cliffs which shelter them from the ravaging coastal winds. In contrast to these gentle valleys, which are watered by streams and set, among a honeycomb of steeply sloping hills, covered by ancient woodland or cleared for grazing, are the dramatic rock formations of Damage Hue cove and the spectacular coast path back over the cliffs. This combination of rural and coastal scenery affords a variety of visual interest, and although some stretches are steep (and others very muddy) the views obtained make the effort well worth-while. In addition several places of historical interest are passed, including Lee Manor House and the site of a former golf-course and quarry. For those who have longer to spare, the area of National Trust land enclosed by the two streams is now an Open Access Area, offering even more possibilities for exploration. 1. From the car park near the sea front take the footpath which runs inland (away from the cove). Follow it to the far end of the meadow where there is a stile on the right. Cross the meadow, below the wall of Southcliffe Hall, to another stile leading into the woods. 2. Cross the footbridge over the stream and take the right-hand path to Higher Warcombe. Follow it uphill through the woods, passing the Manor House and climbing steeply until reaching a stile leading into a rough field. 3. Turn right as indicated by the Waymarker arrow then almost immediately left, away from the coast towards the high ground. Once at the top, keep alongside the bank in the direction of the telegraph wire and make for the corner of the field, well to the left of the cottage, where there is a stile leading into a lane. 4. Turn right and follow the lane downhill. 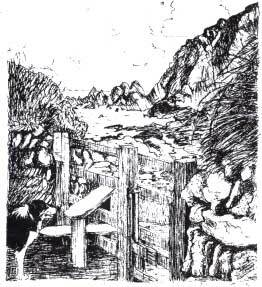 On the 3rd bend is a footpath sign; turn left down this track until you come to a stream by a gate and a stile. 5. Cross into the field and carry straight on uphill alongside the fence to another stile. Turn right along the old track from Damage Barton Farm in the direction of Bull Point. 6. After 100 yds. or so take the footpath on the left which runs downhill along the edge of the field. (Notice the Standing Stone on the hillside to the right). Follow the path down through thorn bushes, alongside a stream, to a small gate. 8. At Bennett’s Mouth cross the stile and footbridge to the other side of the cove and follow the Coast Path uphill. At the top of Damage Hue Cliffs the path levels out before dropping sharply to the last valley before Lee. The conical hill visible on the other side is Flagstaff Hill. Cross stiles and footbridge before climbing the last stretch. 9. Where the Coast Path ends, turn left into the lane and follow it downhill to Lee Bay cove and car park. A black pit where a Snowflake dumped coal. A hill where a flagstaff once stood. The site of a former golf course and club house. In years gone by the cove was the focal point of the working life of the village, utilising many natural resources to produce essential products. The picturesque cottage on the right-hand side of the bay was a working mill until the 1890s, when the mill wheel was removed. A fine old bread oven has been discovered in the kitchen wall. Like many coves along the North Devon coast, Lee Bay used to receive supplies of coal and lime by boat. Coal was delivered by a steam coaster called “The Snowflake”. The area on the left-hand side of the bay, where the coal was dumped, was known as “Black Pit”. Nearby there was a lime kiln in which some of the coal was burned to prepare the lime, brought in by boat from Wales, for agricultural use on the farms. In addition to reducing soil acidity, lime was used in the making of mortar and whitewash for buildings. Also near the beach there was once a Spinning Barn which was where the women came to spin the wool bought from farmers, and which acted as a village gathering place. Damage Valley, Bennett’s Mouth . An old footpath leads from Damage Barton Farm to the cove under Damage Hue Cliff at Bennett’s Mouth. 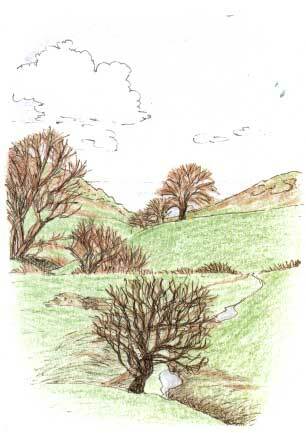 Near it are several Standing Stones, one of them on the hillside close to the path and clearly visible from it. They are curiously shaped pieces of quartz, listed as ancient monuments. In 1889, amidst a terrible thunderstorm, the SS Lymington foundered on the treacherous rocks of Bennett’s Mouth. During the 2nd World War, one of the local Defence Volunteers, a Mortehoe man ‘ named Ben Bryant, was so convinced that if the enemy invaded they would land at Bennett’s Mouth that he went alone every night to keep watch armed with only a shotgun. This ancient woodland which surrounds the Lee Manor Hotel, had most of its oak trees felled for pit props during the lst World War. The bungalow of the same name was built with stone from the original Lee School (which stood in the wood by the stream). The bungalow is opposite the cove on the site of an old limekiln. Lime was brought to Lee by boat from Wales, burnt in the kiln and then used on local farms. The original name of the hill was Warborough, derived from the Old English “Waru-beorg”, meaning “Watch hill” and probably connected with the name for the locality, Warcombe. Its elevated position makes it an ideal lookout. From the 1880s it became known as Flagstaff Hill, and the flagstaff itself remained until 7th September 1952 when it was cut off by lightning. Several small cannon also stood there until the turn of the century. They were fired on festive occasions, such as the return of Mr. and Mrs. Drake-Cutliffe from their wedding trip in 1898. On the south-west side of Flagstaff Hill is an old quarry. Stone was taken from here for the building of the Manor House in 1897 but as the quarry is marked on the 1890 map it must already have been in use. Quarry Cottage, named for obvious reasons, stands just above the junction of the Coast Path with the Lee-Mortehoe lane. This was situated on the slopes around Flagstaff Hill and inaugurated in May, 1906. It was financed by Johnny Walker, laid out by James Braid (5 times Open Champion) with the help of Harry Vardon, the work being carried out by five local men. Mr. Drake-Cutliffe was the first President, and drove a ball from the first tee to declare the course open. It was originally a 9-hole course, but was enlarged to 18 holes in 1921-22. The grass was rarely cut and there was rough scrub instead of bunkers so the greenkeeper did a good trade in replacement balls. In 1923 James Braid returned to play an exhibition match which he completed in 65 (3 under the course record). The clubhouse stood above the present footpath just under the summit of Flagstaff Hill and the foundations are still visible. It was a wooden building with a verandah and must have had splendid views. During the war the land was so neglected that it was thought too difficult to restore and the club was eventually disbanded. The clubhouse was finally removed in 1956.